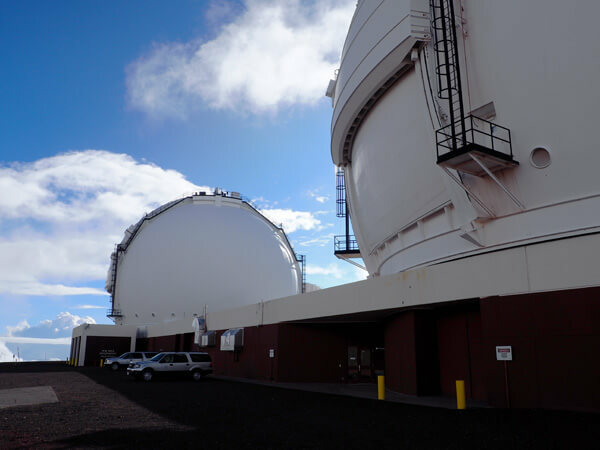 In order to function as a single surface the segments must be aligned extremely precisely to each other, using a procedure known as “phasing.” The twin telescopes of the W. M. Keck Observatory on Mauna Kea, Hawaii, each contain a primary mirror consisting of 36 hexagonal segments. Phasing mirror segments is accomplished using a technique that gathers light from the seam between two segments and analyzes it to determine how well the two segments are phased. Several of the mirror segments have proven difficult to phase using the developed method, however. Scientists on the project theorized that the surface of the mirrors in this area was becoming rougher, from repeated stripping and re-coating of the mirrors since they saw first light in 1990. The segment surface artifacts would have serious implications for phasing, as well as limiting observations. The challenge, then, was to measure the roughness in the seam area to verify the surface structure. Measurements with optical profilers had been attempted in the past without success. These instruments are typically constrained to a microscope-like stand, which precludes measurement of larger components. More recently a 4D Technology NanoCam Sq Surface Profiler was brought to the observatory to measure the seam area of the problem mirrors as well as known good mirrors. The NanoCam Sq was able to provide the first roughness measurements of these crucial areas of the Keck segments. 4D Technology’s Neal Brock worked with Mitchell Troy (JPL) and Gary Chanan (UC Irvine) to analyze the data. The results showed that the surface roughness had, in fact, not worsened over time with repeated stripping and re-coating. The roughness was well within the original design tolerances. The data did, however, lead researchers to determine that surface artifacts, including plateaus as high as 700 nm, had been caused by the three-point mount used to secure the segments during ion beam figuring. During this final step of the surface figuring process, portions of the mount had blocked the ion beam in some areas, causing plateaus which were determined to have caused some of the observed phasing anomalies. This testing also led researchers to ongoing investigation into other potential side effects of the ion beam figuring process. In the image below the NanoCam Sq can be seen measuring a Keck mirror segment. The instrument’s ability to measure to the very edge of the segment made it particularly well suited for this application. 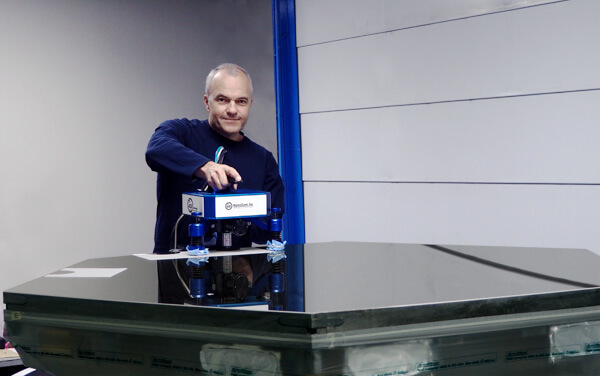 Its ability to measure despite vibration made it possible to complete the measurements in the environment shown, without a vibration isolation table or other expensive apparatus. 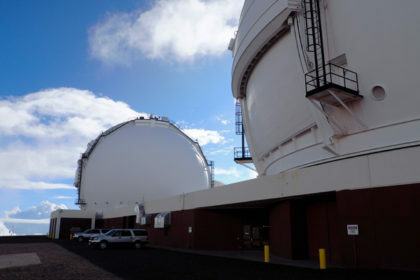 Phasing mirror segments is also crucial for other large telescope projects, including the Thirty Meter Telescope (TMT) and the European Extremely Large Telescope (EELT). The discoveries of the Keck measurements are directly relevant for segment manufacturing for the TMT and for other segmented telescopes as well. The researchers Troy, Chanan and Brock will present their findings (“Keck Segment Surface Artifacts: Impacts on Segment Phasing and Image Quality”) in June at the Adaptive Optics for Extremely Large Telescopes conference. Images Courtesy of the W. M. Keck Observatory.